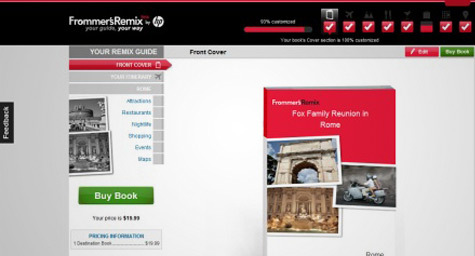 Travel Marketing-Is Frommer's Remix the Way to Go for Travel Guides? Travel Marketing-Is Frommer’s Remix the Way to Go for Travel Guides? In an effort to advance the traditional travel guide to the digital age, Frommer’s recently launched Frommer’s Remix, an online service that allows users to create their own virtual travel guides. Now, the service has been enhanced in numerous ways. Tnooz.com reported on how Frommer’s Remix has been revamped. When the service debuted, it featured content, reviews and recommendations for 35 major destinations around the world. It enabled users to design their own digital travel guides filled with all of their itinerary details. Then Frommer’s would compile the data into a hard copy for $19.99 and send it to the user. Now, the service has become more personalized. Users have the option to add customized elements throughout the guide, as well as the ability to select restaurants, entertainment venues and attractions of interest. They can also preview the guide before completion. There are plans for even more improvements, including optimized versions for mobile devices, the ability to add a wider range of activities and the option to order multiple copies of the guide for group excursions. While Frommer’s has always insisted that paper-based travel guides were the easiest and most popular with travelers, the growing popularity of mobile devices and eReaders begs the question of whether travelers will want to continue carrying around hard-copy travel guides. For now, it looks like Frommer’s Remix is trying to integrate the technological into the tried-and-true in order to stay relevant and reliable to travelers. To learn more about the latest trends in travel marketing, contact MDG Advertising today at 561-338-7797 or visit mdgadvertising.com.